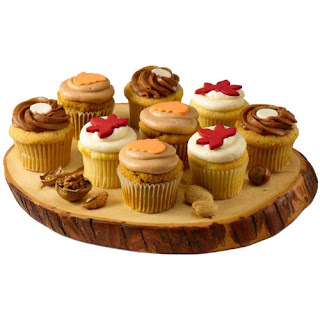 Fall Cupcakes – 9 for $55, Three each of Pumpkin with Pumpkin Cream Cheese Icing, Cinnamon with Mayan Chocolate Buttercream Frosting and Vanilla with Vanilla Frosting. 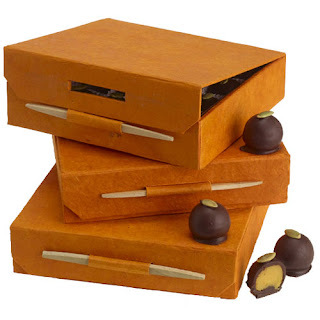 Pumpkin Truffles – $36, These truffles are filled with white chocolate ganache with a hint of nutmeg and wrapped in dark chocolate. 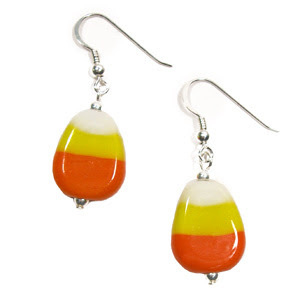 The flavor sounds so interesting! 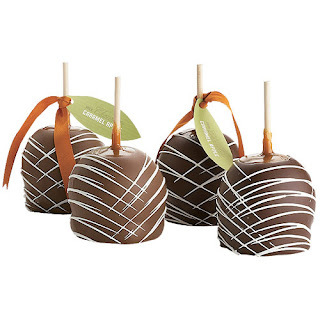 Caramel Apples – $48, I love caramel apples and nothing says Halloween quite like these caramel & chocolate dipped ones. 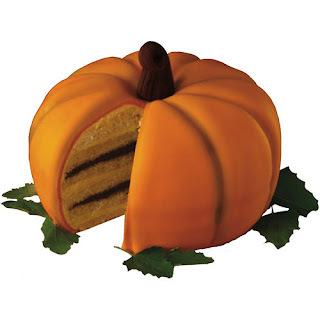 Pumpkin Cake – $120, This cake is too cute! It has six layers of vanilla spiced cake with praline butter cream and also a layer of chocolate fudge. 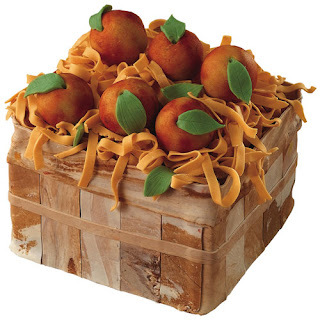 Apple Crate Cake – $200, This cake is almost unrecognizable! It really looks like a crate with apples inside. No wonder it costs so much. 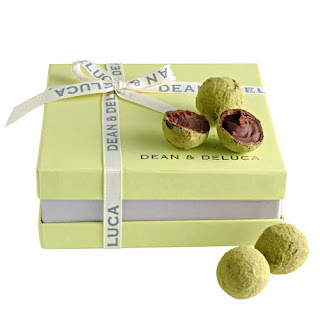 Green Tea Truffles – $42, The color of these green tea truffles definitely caught my eye. 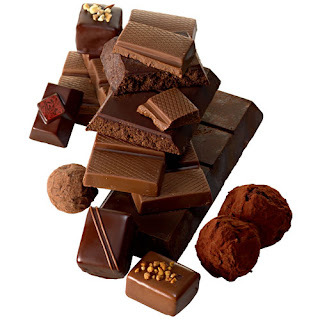 Chocolate of the Month – $180-$720, I’ve heard of monthly wine clubs, monthly coffee clubs, even monthly fruit clubs, but a Chocolate of the month program is definitely something new and more my style. You now have the opportunity to try a new assortment of chocolates each month and have them delivered right to your doorstep. There’s a 3 month, 6 month, and 12 month program. 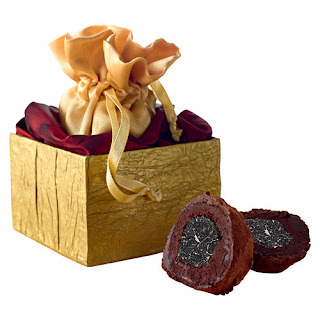 The Ultimate Chocolate Truffle: La Madeleine Au Truffle -$350, The description says its a “1 oz. fresh tuber melanosporum dipped in a dark chocolate ganache“. Ok, I know what you guys are asking…what is a tuber melanosporum? Well, that’s just the scientific name for a Black Truffle. And it’s not to be confused with chocolate truffles. Although in this case this Truffle is in a way a chocolate truffle, more like a chocolate truffle truffle. Anyway, Black Truffles are those very expensive fungi found in France by specially trained pigs or dogs. I’m not sure how you would even eat this ultimate truffle, just bite into it? And I’m also curious about the taste…I like chocolate truffles and I like Black truffles in dishes, but the two together seems like a pretty odd combination. I finally got to Kean Coffee today! I’ve been wanting to go to Kean Coffee for a few weeks now after reading all the positive reviews about it on Yelp. My friend told me he tried it for the first time yesterday, so I decided to take a trip there today and I also dragged my friend back there, but he didn’t mind since he claimed that the coffee was “really good”. The place was packed and super busy, but I guess that’s just a good sign that people really like the place. I ordered a Caffe Napoli Latte (hazelnut & white chocolate flavor), which was one of their house specialties. My latte was filled to the brim in a big white coffee cup and I was pleasantly surprised by the lovely latte art in the foam. Apparently, latte art is done by all the barristas and it is their signature finishing touch. I’m a sucker for details! Anyway, my latte was just the way I liked it…sweet and not too strong. I’m not an avid coffee drinker, so usually coffee for me is pretty much coffee flavored milk with a lot of sugar haha. I must be a pretty weak coffee drinker, because after I had my latte the caffeine was hitting me hard and I was really jittery. Overall, I really liked Kean Coffee and its nice to know there’s a coffee place that takes pride in making a great cup of joe. 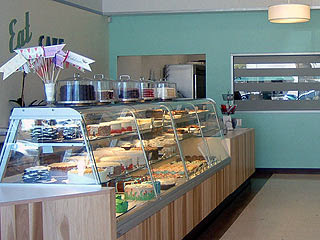 To my delight, there was a bakery called SusieCakes right next to Kean Coffee! Of course, I had to stop by and check it out. 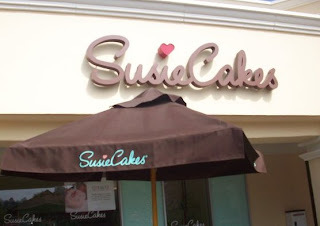 SusieCakes is very reminiscent of Sprinkles, even down to the font of their store name. They had a large assortment of cakes, cupcakes, dessert bars, and other goodies. Right when I entered the store, there was a tray with samples for their 6-layer Chocolate Fudge Cake (very yummy by the way). It’s always a plus to get samples! I settled for the Red Velvet Cupcake which was $3, which is 25 cents less than Sprinkles, but I noticed that the cupcake was a tad smaller, so I guess it evens out to be the same. The cupcake was really good, moist, and not crumbly at all. 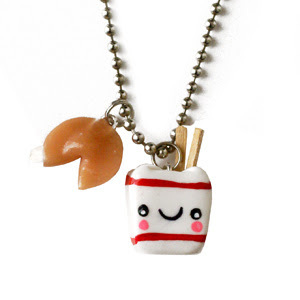 I’m sorry Sprinkles, but I think SusieCakes takes the cake for this one. There was one thing that I didn’t like and that was the consistency of the frosting. The frosting had good flavor, but it was quite goopy. Getting the cupcake out of the bag was a big mess since the frosting was just too sticky and melted, so it got all over my hands. I think that frosting needs to have a thicker consistency, so that it actually stays on the cupcake and won’t fall off as you’re trying to eat it. 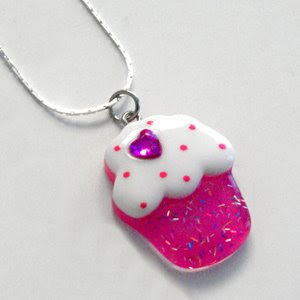 Despite the frosting fiasco, SusieCakes is definitely one of my favorite cupcake shops now. 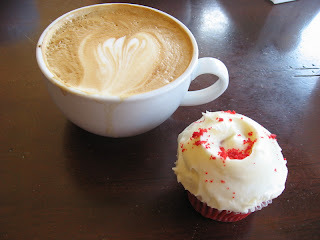 But, don’t get me wrong, Sprinkles still has a place in my heart and it will still be my go to cupcake shop since SusieCakes is a little out of the way for those last minute cupcake cravings. 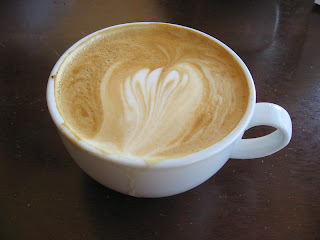 Caffe Napoli – I love latte art. 1. 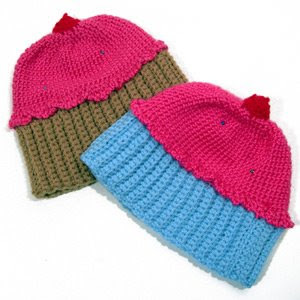 Combine the sugar, cream, milk, and vanilla in a bowl or pitcher(this makes it easier to pour). 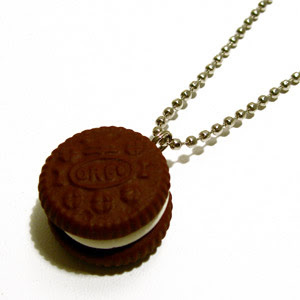 WARNING: DO NOT add the Oreos to the liquid mixture!!! Pouring the mix into the ice cream maker. Our finished product: Grey ice cream…still tasted good, but its not the same without the Oreo cookie pieces.